Nature has been very generous to the area of Sami as the location is surrounded by lush vegetation, underground caves and beautiful lakes. In Sami the green of the trees touches the white of the sand and the blue of the sea, offering stunning sceneries like those in the Hollywood film “Captain Corelli’s Mandolin” which was filmed in the town of Sami and the neighbouring beaches. The town used to be one of the four major towns which formed the Kefalonian tetrapolis in the ancient times. It has been inhabited since the prehistoric age, whereas nowadays is a safe port for domestic and foreign ferries. Sami combines its rich historic background with beautiful nature and thus is a top-notch destination for all kinds of travellers. On the top of the hill, the ancient ruins show that Sami was a well-organised and flourishing town. It was the only town on Kefalonia to resist the Romans who wanted to occupy Sami because of its strategic location. Here lie the ruins of the ancient castle (Paleokastro) and the acropolis of Kyatis. The convent of Agioi Fanentoi is also located in Sami and it is worth a visit if you would like to become more acquainted with Greek Orthodox churches and their treasures. Another convent on the top of the hill is the Agrilies convent which was named after the surrounding trees, called agrilies in Greek. From here, you can enjoy spectacular views of the bay of Sami and Ithaca. The cave of Melissani and the Drogarati cave –the two most visited and well-known sights of the island – are situated in Sami, but what is unique about the area is the 17 registered locations of caves and underground lakes. This makes it the only place in Greece with so rich geomorphology. To give you an example, lake Avithos, the allegedly bottomless lake, is near Sami on the way to Poros. The rare flora and fauna make the scenery incredibly beautiful. Another lake found here is the lake of Karavomilos in the town of Sami where the waters pass through the watermill before they end up in the sea. Sami is a lively town which provides all kinds of facilities. If you decide to stay in Sami, there will be no need to go to Argostoli or other places for daily necessities or for emergencies. Here you have all you need, from pharmacies and a medical centre to ATMs, post office, police, coastguard and a fire department. There are a lot of shops to buy souvenirs and pieces of jewellery, super markets and grocery stores. For your accommodation, there are plenty of options, such as hotels, studios and rooms to let. Even though Sami isn’t the place where you would dance the night away and party till dawn, there are a lot of “tavernas”, cafes and bars lined along the harbour, ready to offer delicious meals and refreshing drinks. If you like beach holidays, then Sami will reward you with amazing beaches of white sand and emerald waters. Apart from Karavomilos which is the main beach of the town, just 4 kilometres away from Sami is the famous beach of Antisamos. This is one of the main beaches where Captain Corelli’s Mandolin was filmed and the scenery is as if you have taken it out of a postcard! Even though there is a beach bar with sun loungers, the beach doesn’t get too crowded and you can still find unspoilt and more secluded spots. From Karavomilos on the way to Agia Efimia, there are a lot of small coves with the beach of Agia Paraskevi being the largest one. 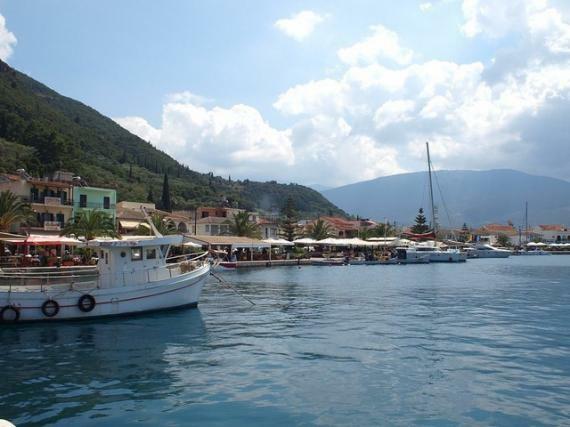 All of them are easily accessible by the coastal road and offer stunning views of Ithaca and the bay of Patras. If you want to experience the mystery that surrounds the special geological phenomena of Kefalonia and the island’s incredible nature, then Sami is the right place for your holidays! Find information about selected Hotels, apartments and rooms in Sami to choose the perfect place for your accommodation.